The Amazon River supplies more freshwater to the ocean than any other river in the world. This enormous volume of freshwater forces the estuarine mixing out of the river channel and onto the continental shelf. 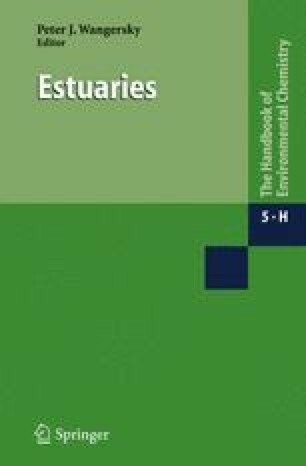 On the continental shelf, the estuarine mixing occurs in a very dynamic environment unlike that of a typical estuary. The tides, the wind, and the boundary current that sweeps the continental shelf have a pronounced influence on the chemical and biological processes occurring within the estuary. The dynamic environment, along with the enormous supply of water, solutes and particles makes the Amazon estuary unique. This chapter describes the unique features of the Amazon estuary and how these features influence the processes occurring within the estuary. Examined are the supply and cycling of major and minor elements, and the use of naturally occurring radionuclides to trace processes including water movement, scavenging, sediment-water interaction, and sediment accumulation rates. The biogeochemical cycling of carbon, nitrogen, and phosphorus, and the significances of the Amazon estuary in the global mass balance of these elements are examined.